A small group of retired federal corrections officers won their case against the District of Columbia in which the guards were seeking broad concealed carry rights through a permit via a 2004 federal law. 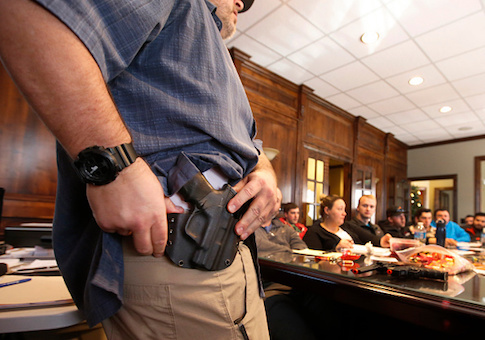 In 2004, Congress passed Law Enforcement Officers Safety Act (LEOSA) later signed by then-President Bush, and although there are some caveats, the bill generally allows current and retired law enforcement officers who meet certain criteria to carry a concealed firearm nationwide without needing the exact permit issued by each state. Robert Smith and the two other plaintiffs who joined him needed forms from their former employer—in this case the District of Columbia—to certify they were retired law enforcement officers. However, in the forms returned to Ronald Duberry, one of Smith's co-plaintiffs, the district checked the box marked "no" on the question of whether the individuals had powers of arrest during their tenure. That one checkmark was enough to deny them the right to the broader concealed carry rights intended by LEOSA. In Smith's case, his former employer would not return the form to him. "I felt discouraged," Smith told the Washington Free Beacon "I was disgusted in a way because after serving the department for X-amount of years, I felt that I was at least allowed the opportunity to even talk to the director to explain my part of the story. I retired in good standing, and I deserved it." Representatives from the DC Attorney General's office did not respond to requests for comment. Their attorneys on the case have about two more weeks to decide if they'll appeal this month's ruling. All three of the plaintiffs claimed that after retiring they had faced threatening situations with criminals they used to supervise who were now out of prison, just one of the situations that lawmakers intended LEOSA to combat. Smith recalled an incident when he was down the block from a small funeral-like gathering taking place at a house, and some inmates he had previously supervised were there. "He [one of the former convicts] told me, up the hill screaming, ‘Yeah, Sarge, I see ya down there, you better get your [bullet proof] vest on when I get down there.'" "I realize how easy it is for things to happen to you," he added. "We documented for the federal court over and over again that [the plaintiffs] are constantly receiving threats, they are in a state of insecurity, and this is not something new," said Aaron Page, part of the legal team from Gowen Rhoades Winograd & Silva that represented the trio. "For us, the case was always a no-brainer, as far as these specific plaintiffs go. They are obviously law enforcement, they now face a security threat in retirement, there's a statute that's designed to help them, they deserve access to that remedy," Page added. The legal win for the plaintiffs wasn't a straight road. After filing suit in 2014, they lost early on in front of U.S. District Judge Rudolph Contreras, but then won an appeal at the federal appellate level. The district argued "that ‘statutory powers of arrest' as used in LEOSA is a term of art that refers to authority to make a warrantless arrest within the meaning of the Fourth Amendment for commission of a crime," according to Contreras's ruling. As the case went on, the district went even further in their arguments, later claiming that while some D.C. corrections officers did execute arrest warrants, none of the plaintiffs were ever asked to do so during their careers. But the D.C. Circuit Court of Appeals's interpretation soundly rejected this argument. Judge Contreras said D.C. laws "authorized them to execute warrants for the arrest of parole violators, satisfying the LEOSA ‘statutory powers of arrest' requirement." According to Page, one of the upshots is that the district has left themselves with less leeway on the issue going forward now that a ruling is in place. "They've really boxed themselves into a corner," Page said, noting that a settlement might have avoided the broader implications of the case, which now stands as precedent for future plaintiffs.